Mountain View’s Morgan Hammond (32) shoots over the reach of Elk Lake’s Madison Tewksbury (4). Mountain View and Susquehanna kept pace setting up a showdown of 3-0 girls’ basketball teams Monday night by picking up wins in the Lackawanna League Division IV. Susquehanna set the stage with two convincing wins. 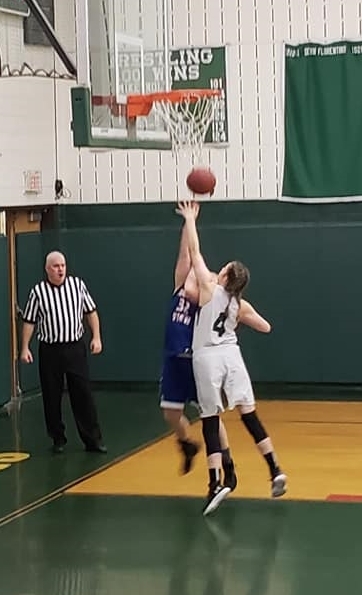 Last Monday the Lady Sabers faced Elk Lake and Susquehanna jumped out to a 27-6 halftime lead on their way to a 49-30 victory. Mackenzie Steele led the way with 16 points; Bethany Maby added 15. Taylor Huyck chipped in with 11 for the Lady Sabers. Mercedes Zajaczkowski led Elk Lake with 14 points. Susquehanna pushed their league record to 3-0 with a 69-12 dismantling of Blue Ridge on Thursday. Steele and Mackenzie Heath each scored 6 points and Huyck added 5 as Susquehanna jumped out to a 19-2 first quarter lead. Heath led the way with 19 points including 5 three-point field goals and Steele added 16 points. Maby had 13 and Huyck chipped in with 11 for the balanced Susquehanna attack. Danielle Goff led Blue Ridge with 8 points. Mountain View set up Monday’s showdown with a 49-41 victory on the road at Elk Lake. Mountain View jumped out to 9-5 lead after one quarter as Sydney Newhart scored 6 of her game-high 19 in the quarter. The Lady Eagles furthered extended the lead to 25-15 at halftime as Mountain View’s Abby Neri added a couple quick buckets. Elk Lake cut the lead to 7 after the third as Krista Jones knocked down a couple threes as the Lady Warriors won the quarter 16-13. Mountain View seized the momentum in the fourth and held on to win as both teams struggled from the foul line. Newhart’s 19 led the way and Neri added 13 for Mountain View, while Morgan Hammond chipped in with 9. Elk Lake got 14 points from Jones and Zajaczkowski added 10 while Maddie Tewksbury snared 13 rebounds and scored 6. Earlier in the week Mountain View traveled to Taylor in a rematch of their Holiday tournament game with Riverside. As in December the host Lady Vikings jumped out early gaining a 23-11 first quarter advantage and put the game away with a 19-2 second quarter on their way to a 60-22 victory. Regan Cameron led the way with 6 points for Mountain View. Montrose kept pace with the two front runners with a pair of victories. On Monday, Montrose opened with 16 first quarter points and limited Blue Ridge to 5 points in the first half on their way to a 53-21 win. Harper Andre and McKenzie Reeves each hit 3 three-pointers and Tangi Smith added 2 as the Lady Meteors used a three-point barrage to open things up. Andre finished with 11 points and Reeves added 9 to lead Montrose. Goff had 9 to pace Blue Ridge. The Lady Meteors hit the road to play Lackawanna Trail. Smith led the way for Montrose with 15 points as the Lady Meteors slowly pulled away from the Lady Lions on their way to a 46-37 win. Montrose led 10-6 after one and extended their lead to 16-10 at halftime. Trail used a run at the end of the third quarter to cut the lead to 25-20 heading into the fourth quarter. The offenses opened up on both sides although both teams struggled at the free throw line as Montrose outscored Trail 21-17 for the final margin. Along with Smith, Brianna Spence added 13 points and Andre chipped in with 11. Forest City couldn’t overcome a slow start in their loss to Lackawanna Trail. The Lady Foresters fell behind 24-4 after one stanza on their way to a 63-37 loss. Sarah Korty had 13 and Madeline Shema scored 11 to pace Forest City. Thursday the Lady Foresters found out why Dunmore is one of the top 3A teams in the state of Pennsylvania as the Lady Bucks opened with a 28-6 first quarter on their way to a 73-27 win. Bella Pleska led the way for Forest City with 14 points. Be the first to comment on "Lady Sabers, MV girls wins set up decisive game"